Hello everyone! 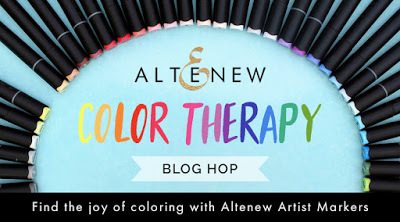 I'm so excited to be a part of Altenew Color Therapy Blog Hop! You should have come from Lydia Fiedler, but if not please start at the Altenew blog. Today, I decided to make one layer card featuring beautiful Dearest Friend stamp set. I've started by stamping my background on a white paper using Wood Pallet Background Stamp and Rocky Shore Altenew inks. Then I blended the same inks on the bottom of my panel. 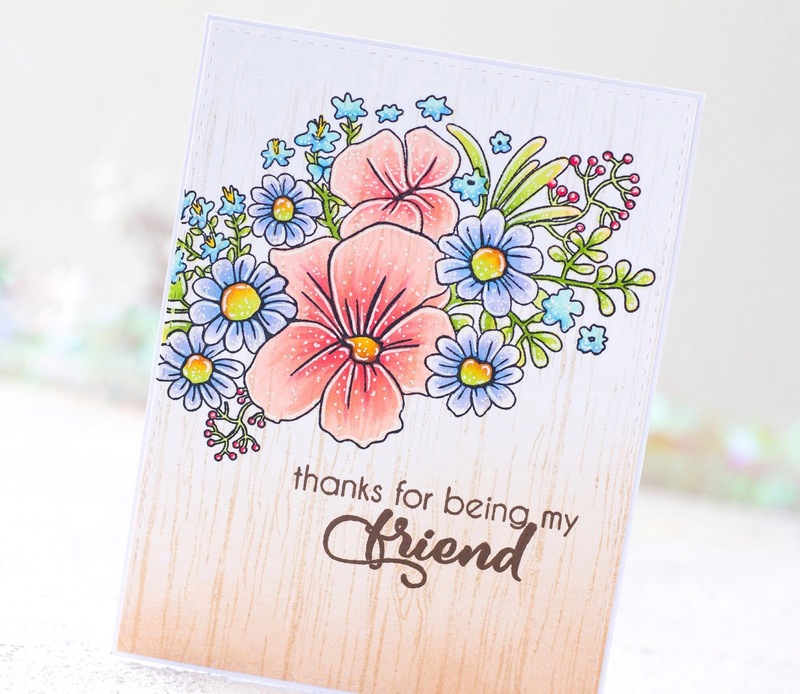 Once my background was finished, I stamped the flowers from dearest Friend set with black ink on top of my blended panel and colored the images using Altenew markers. I used R101,R301, R302, R403, R304, R206, Y612, Y823, Y204, C001, G702, G715, R400, B201, R902, B002 shades. Next, I stamped the sentiment from Birds of a Feather stamp set using chocolate ink and my card is complete. Your next step is Kymona Tracey! I am giving away a $20 gift certificate to Altenew right here on this post! The winner will be announced on this post on July 20th. Additionally, Altenew is giving away a $30 gift certificate to six lucky winners! Please leave a comment on the Altenew Card Blog and/or Altenew Scrapbook Blog by Wednesday, July 18th for a chance to win. Six winners will be announced on the Altenew blogs on 7/22/2018. The winner of $20 Gift Certificate is KATHY FERGUSON! by 7/30/2018 with the subject line Altenew Color Therapy Blog Hop Winner from Kristina's blog. What a beautiful card. I love the soft colors. Thank you so much for sharing. Such a lovely card! I love the way you blended the ink on the bottom and your flowers are soft and sweet. and I love the wood BG. Lovely card! Love the tone of it. Your beautifully colored background as well as the flowers are stunning!!! Can't believe how wonderful to use pens that match the ink pads and how wonderful they look together! Your card is stunning ! Your coloring is fantastic. WOW Kristina, your card is gorgeous. What I love about what I see with these markers is you can have such bold depth of colour or the beautiful pastel shades that you have achieved. I am extremely impressed! Beautifully done! Great design and perfect coloring! Such a lovely card...so soft ....thank you so much for sharing it. Very pretty card very soft colors. Wow... you hit a really soft look with these markers! Very pretty! GORGEOUS, GORGEOUS, GORGEOUS card! Your coloring is just so FANTASTIC! And I so love the Wood Pallet Background too!! Love your soft pastel coloring!! Just beautiful! So beautiful! I LOVE those soft colors & your gorgeous coloring! Great design also! Hi Kristina! Your card is beautiful and the color palette is gorgeous :) TFS! Amazing card! I love the wood background. The muted colors are so pretty with the background. So pretty! Love the soft coloring and the delicate woodgrain! Beautiful card! I love how you got the colors so soft. How do you do that with markers? This card is so beautiful! Thanks for sharing! I love the softness of the pastel colors you chose for your florals. The wood background is lovely too. Thanks for the inspiration. 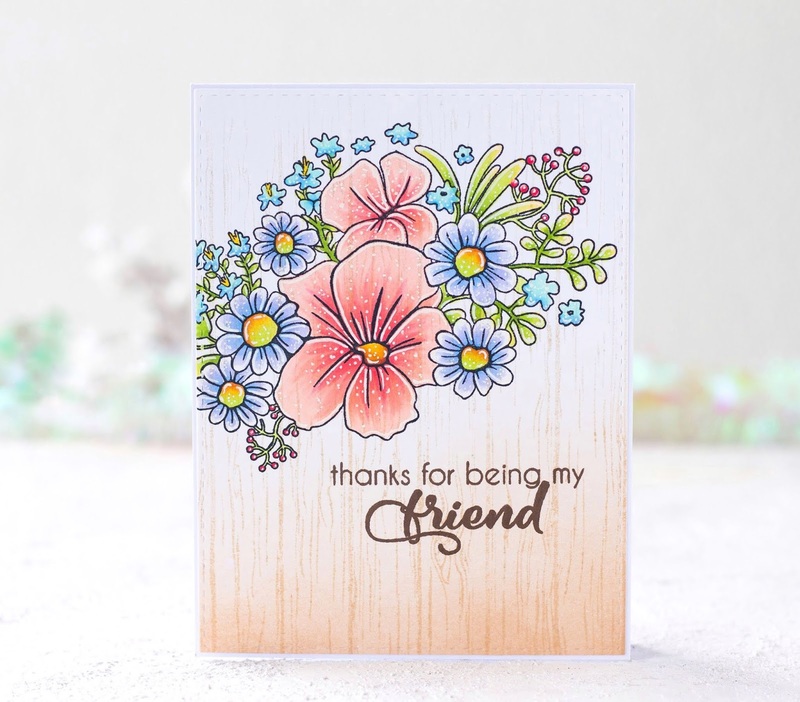 I love the wood look background, it works perfectly with the flowers and all the colors are beautiful together. Love the soft background. And the flowers are gorgeous. Difficult to believe this is a one layer card. Soft and subtle colours really make a statement on this pretty card. Beautiful; love the soft muted colors!! Such a sweet card. Love your coloring. Wonderfuljob with the single layer! So much detail! Gorgeous OLC! Amazing coloring and love the ink blended ombré background with the soft woodgrain. Beautiful card and I love the soft colors you used. So pretty and such a great coloring job! Beautiful card. Love that it is one layer and the background looks great slightly showing through the flowers.. Love it. Gorgeous card! Beautiful image and coloring. I love the blended background. Simply beautiful! Love the softness of the blended background. Love the soft pretty colours and the wood background is perfect. Blown away by this background and entire project! Thanks for sharing! This is a totally beautiful project. I love your background and the way it complements the whole. Thank you. Love this floral design! Beautiful card! I love your color choices for this bouquet! Just beautiful! So pretty--love the colors and the wood pallet background. Beautiful! Love the wood pallet background and the coloring. Love the coloring over the woodgrain look! These are extra fabulous and pretty. Gorgeous card and excellent choice of colors. The soft background looks so elegant. Thanks for the inspiration. Gorgeous coloring, love the dreamy look. What a gorgeous design Kristina! Those flowers look so pretty, thanks for the inspiration!